"In November 2016, my coauthor science historian Consuelo Cuevas-Cardona, published with her brother, astronomer Salvador Cuevas-Cardona, a paper about observations of auroras in Mexico in a non-scientific journal of history and stories of Mexico," explained Juan Américo González-Esparza, head of the Mexican space weather service and researcher at the National Autonomous University of Mexico in Morelia, Michoacán. He is the lead author of a new study on the Mexican aurora observations in Space Weather, a journal of the American Geophysical Union. "A friend of mine send me a link of the article and then I realized that this was the first record, to my knowledge, of the Carrington aurora in Mexico," González-Esparza said. 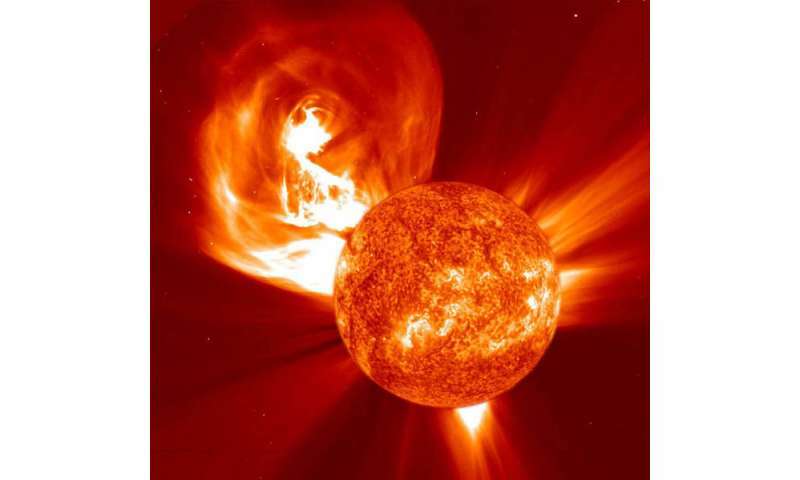 In the new Space Weather paper, the researchers have published the first English translations of the 159-year-old observations and brought them to the attention of the international space weather community. "By one o'clock in the morning of the second, the reddish light had spread towards the constellation commonly known as the Seven Goats (Pleiades). The light was seen against a background of red, which was reflected on the walls and towers of the city, illuminating the streets to a considerable degree. From the initial point where the light had appeared in the north, white streamers began to extend, not unlike those which can be observed radiating from the sun at sunset." La Sociedad also published reports of the aurora from Guadalajara, Hidalgo, Mexico City and Guanajuato. "We found at least seven locations where the red aurora was observed on the night of 2 September 1859," González-Esparza said. As to why the reports did not make it beyond Mexico, part of the reason is that they were not in scientific journals, and so scientists outside of Mexico would not likely have seen them. Another reason was the Mexican civil was under way at the time and La Sociedad was aligned with the conservatives, who eventually lost. "The civil war period was a very dramatic epoch for Mexico," González-Esparza explained. "They were fighting to define the role of the Catholic church in the government. The liberals defeated to the conservatives, but in 1861, there was a French invasion and Napoleon put an Austrian emperor in Mexico (Maximiliano)." The war lasted a few more years and ended when the liberals defeated the conservatives and Maximiliano. La Sociedad ceased publishing after 1867. The accounts of the Carrington Event are not just a historical curiosity, González-Esparza said. They are important for Mexico today. "Before we knew this confirmation of the effects of the Carrington event in Mexico, many colleagues though that our low latitude region was immune to space weather effects," he said. "This confirms that our country is vulnerable to intense space weather events and we need also to prepare a national strategy to prevent a Carrington like event."